Daytona Beach has remained a historic destination, playing host to a motley crew of bikers, adrenaline junkies and tourists who make their yearly pilgrimage down Main Street to the accompaniment of exhaust pipes and live music. A near-constant procession of motorcycles tear up and down the street as crowds of onlookers cheer and raise their drinks in appreciation. This week-long event is for those who worship speed and spectacle and practice the ritual of letting loose. It's also for the photographers who wish to capture every moment of the revelry. 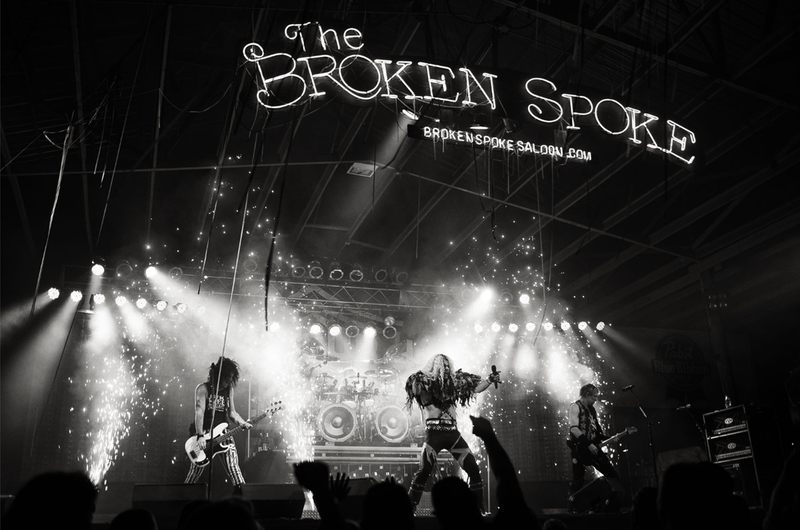 This exhibition is a visual exploration of the eclectic artisans, motorcycle enthusiasts, musicians and revelers captured during celebrations on historic Main Street and the Riverfront Park District, plus special events, shows and concerts held at the Iron Horse Saloon and the Broken Spoke Saloon off North US Highway 1. The city of Daytona Beach drastically changed its perception of Bike Week starting in the later 1980's, viewing the event with a favorable eye and stringing banners across Main Street to welcome bikers to town. And increasingly, Bike Week has become more gentrified–new enthusiasts are joining the ranks of seasoned bikers and altering the subculture to a discernible degree. The rowdy, extremely raunchy and subversive attitudes of the past have become somewhat distilled, and with each passing decade, Bike Week has become a symbol of camaraderie, community and a celebration of a subculture–with just a hint of that underlying renegade spirit–that's revered citywide. The popularity of Bike Week in Daytona Beach is undisputed, with nearly half a million riding in with the intent to see and be seen as they cruise down Main Street. Photographer Ken Kirby offers viewers a selection of the many faces he documented–young and old, men and women–as they rode into town. There some exceptions to the monotony of leather clad and studded bikers though–variations of the four legged kind–as dogs dressed in patriotic costumes by their owners or wearing pink goggles drew attention and humorous chuckles from passers-by. But it will always be the motorcycles themselves that steal the show. It is the endless parade of custom paint-jobs and styles that excite the imagination and elevate the competition, keeping the spirit of innovation alive within the industry. In fact, there are those who see beyond its simply mechanics–its primary function as a mode of transportation–and view the motorcycle as an art form. 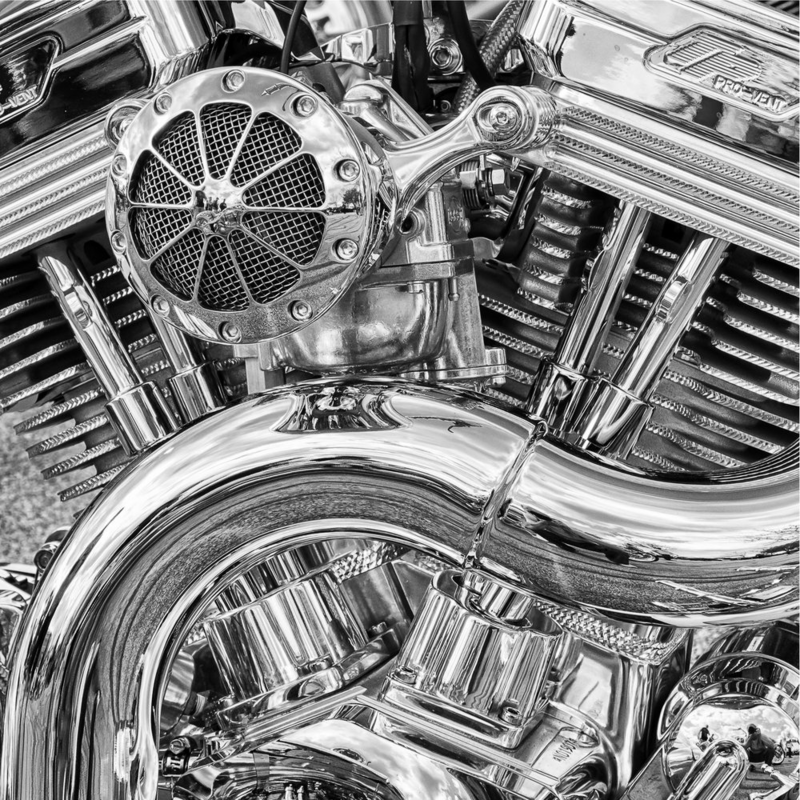 In Bill McSherry's photographs, intricate patterns of gleaming chrome pipes wind their way across the frame–crossing, connecting and disappearing at angles–which transform the bike into a work of pure abstraction. Here, the bike becomes greater than the sum of its parts, which are often a costly investment of thousands of dollars. Yet the motorcycle has long been an object of greater cultural significance, inviting debate from both sides: is it the trappings of deviants and non-conformists who wish to exist on the fringes of society or a way of life for pioneering spirits who represent the bond that can form between man and machine? The motorcycle stands as a symbol of freedom and individuality, providing the means of answering that irresistible call of the open road. Those who ride them often wish to push beyond the bounds of normal convention, and no individual embodies that ideal more than Don Daniels. He and his family operate the Wall of Death–a specialized motordrome constructed of wooden planks 14 feet high and 24 feet in diameter–which allows motorcyclists to travel along the vertical wall and perform stunts. 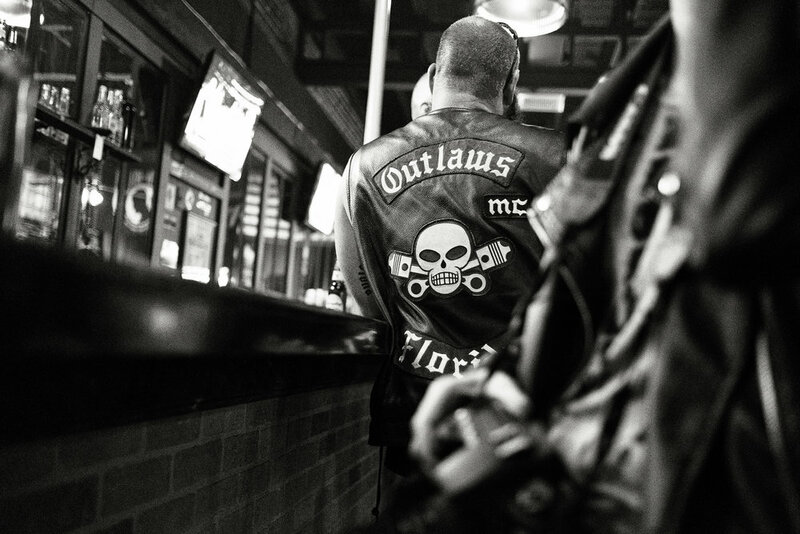 But aside from its entertainment potential, is is also a symbol that has invited criticism and cautionary tales from a general public apprehensive and uncomfortable with the notion of "outlaw" bikers. Anna Helen Vinther's photograph of an elderly biker whose vest is decorated with numerous patches from different county sheriff's offices stands in perfect juxtaposition to Luke Bhothipiti's shot of an Outlaw MC member, his single, yet distinct back patch making a statement all its own. In the background of Lola Gomez's photograph featuring two bikers conversing over a few beers outside the Iron Horse Saloon is a sign that clearly reads "No Colors/Attitudes," a not-so-subtle reminder of the unwelcome tension that exists between rival gangs. The famous photographer Robert Capa once states "if your pictures aren't good enough, you're not close enough." Photographer Luke Bhothipiti, in particular, embraces this philosophy. Not content to shoot from the relative safety of the sidewalk or behind strategically placed barricades, he opts instead to immerse himself in the action by physically interacting with the bikers themselves. During brief pauses in traffic, he darts into the scene, encouraging his subjects to make direct eye contact and react to his intrusion. Some laugh and pander to the camera, while others simply offer a deadpan stare and a serious attitude. He also offers us an exceptional view of a burnout pit as a cloud of thick smoke, and bits of gravel and debris fill the air, causing a pair of ladies to cover their faces as they cough through the biker's showy performance. Whatever draws a crowd is deemed worthy entertainment, and photographer David Swoyer captures the instant an impressive ball of flame blown by "Torch" cuts through the darkness. Photographers Esther De Leon and Jennifer Kaczmarek concentrate on conveying a sense of personality, seeking to single out individuals or couples from the rest of the crowd. They know exactly what to include in their frames to either convey the sense of frantic activity they felt or let it fade into the background. Their images give us additional insight into the various characters and personalities of those attending Bike Week who might otherwise have gone unnoticed. We hope you enjoy these images and wish everyone a safe and happy 76th Annual Bike Week!